Customers have two choices when dealing with travel agents: the choice of either being served by large organizations who can offer you purchasing strength, or a local independent agent who can offer you a higher degree of personal service. City Travel offers you the best of both worlds. A more in-depth analysis of City Travel and our services can be found in this site, but if you would like to talk to City Travel about your specific requirements please contact us directly. To make a flight search, please supply your travel requirements and click one of the search buttons below. 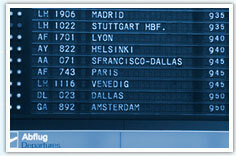 On December 24, 2004 City Travel acquired the ISO 9001:2000 Certificate issued by the American Quality Assessors, AQA. Thus, City Travel became the first travel agency in the South East Europe holding this Certificate.